The Sun does not vary in brightness over the course of a year. Rather, the effective sunlight at any place on the surface of the Earth changes over the year. Because the axis of the Earth is tilted with respect to the perpendicular to the plane of the Earth's orbit around the Sun, different points on the surface of the Earth receive more, or less, sunlight at different times of the year. Here is a figure which shows what we mean by this. The small yellow dot shows the Sun (not drawn to scale, of course!) in the middle of the solar system. The black dashed circle shows the orbit of the Earth around the Sun, and arrows show the direction in which the Earth rotates on its own axis once a day, and revolves around the Sun once a year. This is an almost circular orbit; it appears elliptical in the figure because we are looking at the system almost edge-on (as if we were standing on Jupiter) rather than face-on (as if we stood above the Sun). The Earth has been drawn at four points along its orbit; you can see that the axis is tilted 23 (23.5, to be precise) degrees over from the vertical (straight up). These four points represent the peak of winter (December), spring (March), summer (June), and of autumn (September), in the northern hemisphere. 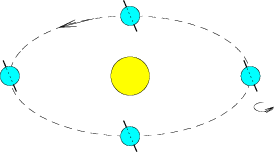 Let us consider first a simpler case than reality: what if the Earth's axis was not tilted? The Earth would no longer tilt to the right, as it does in the figure above. Instead, it would point straight up, and would rotate every day around that straight-up axis. What would the seasons be like? We would still have different weather conditions across the face of the Earth, but at any point on the surface the weather would always be the same (no more seasons!). The regions near the equator would enjoy a constant, steady level of sunlight, much as they do today. The regions at the poles, however, would receive practically no sunlight at any time of the year - eternal dusk, and eternal winter. The regions between the equator and the poles would be warmest close to the equator, and slowly cool off as we moved toward the poles, but individual places would no longer have seasons (why?). New Mexico would become a land of eternal summer, while the Hudson Bay in Canada would lose its summer and become a land of permanent autumn chill (would the Bay freeze over, year-round)? Examine the next figure, to understand why the equator would be warm and the poles would be cold. At the equator (left hand part of figure) the Sun would be overhead, and the land would receive the maximum amount of sunlight per unit area. At the poles (right hand part of figure) the Sun would barely rise above the horizon. The same amount of sunlight, as shown in the figure, would now cover a much larger surface area. This means that the amount of sunlight per unit area would have to drop accordingly, which would make it much colder. This is exactly the difference that we observe every day, between the brightness of the Sun at noon, and the dimness of the Sun in the early morning or early evening. We still see the Sun in the early morning and evening, as it remains entirely above the horizon, but the amount of light that it delivers per unit area is much lower than at noon. 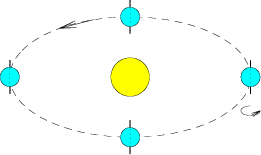 This fourth figure is identical to the third, except that it shows the difference between the sunlight at the equator and the sunlight at the poles in two dimensions rather than in one dimension. Can you see the similarities in the two figures? 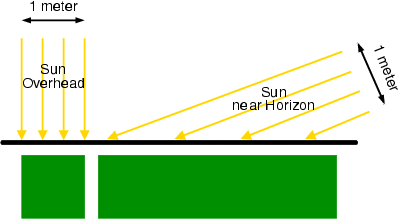 When we think about sunlight shining on the surface of the Earth, we know that the surface of the Earth is a two dimensional surface (is has width and length, like a square or a circle). Next, what if the Earth's axis was tilted by 90 degrees? The Earth would tilt all the way over in the figure above. In December, the northern hemisphere would be completely hidden from the Sun. All of North America and Eurasia would be as cold as the North pole in the winter – and as the Sun would never rise, winter would be one six-month long night. At the same time, the southern hemisphere would be enjoying a six-month long summer season, an endless, baking day with no night. In June, the situation would reverse. The northern hemisphere would enjoy a six-month long day of summer, while the southern hemisphere would be plunged into six months of darkness and cold. What would the effect of this be on vegetation and animal life? Would life, as we know it, survive? In the spring and autumn seasons, the weather would appear more normal to us. It would be very similar to the spring and autumn in our first case, where the Earth's axis had no tilt. (Why is this?) All regions of the Earth would have 12 hours of sun and then 12 hours of darkness, every day. The equatorial regions would receive lots of sunlight, while the poles would be significantly cooler.